Q.What are the sources of revenue for the federal government? A.Roughly 80 percent comes from the individual income tax and the payroll taxes that fund social insurance programs (figure 1). Another 9 percent comes from the corporate income tax, and the rest is from a mix of sources. In fiscal year (FY) 2016 the federal government collected revenues of $3.3 trillion—about 17.8 percent of GDP. 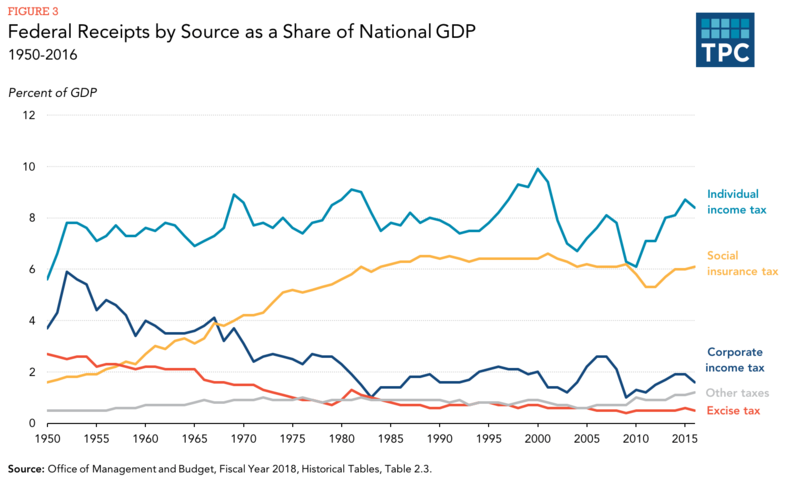 Over the past 50 years, federal revenue has averaged 17.4 percent of GDP, ranging from 20.0 percent (in 2000) to 14.6 percent (most recently in 2008 and 2009). 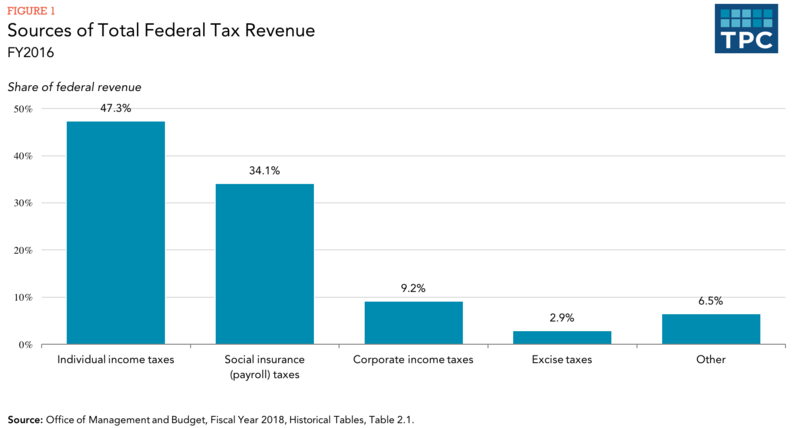 The individual income tax has been the largest single source of federal revenue since 1950, amounting to 47.3 percent of the total and 8.4 percent of gross domestic product (GDP) in 2016. In recent years, individual income tax revenue has climbed as high as 9.9 percent of GDP (in 2000) at the peak of the 1990s economic boom and dropped as low as 6.1 percent (in 2010) following the 2007-2009 Great Recession. The payroll taxes on wages and earnings that fund Social Security and the hospital insurance portion of Medicare make up the largest portion of social insurance receipts. Other sources include payroll taxes for the railroad retirement system and the unemployment insurance program and federal workers’ pension contributions. All told, social insurance levies represented 34.1 percent of federal revenue in 2016. The creation of the Medicare program in 1965, combined with periodic increases in Social Security payroll taxes, caused social insurance receipts to grow from 1.6 percent of GDP in 1950 to 6.2 percent in 2009. A temporary reduction in employees’ share of Social Security taxes—part of the stimulus program following the financial meltdown—reduced social insurance receipts to 5.3 percent of GDP in 2011 and 2012. They remained below 6.0 percent of GDP in 2013 and 2014. The tax on corporate profits yielded 9.2 percent of government revenue in 2016, a revenue source that has been trending downward. 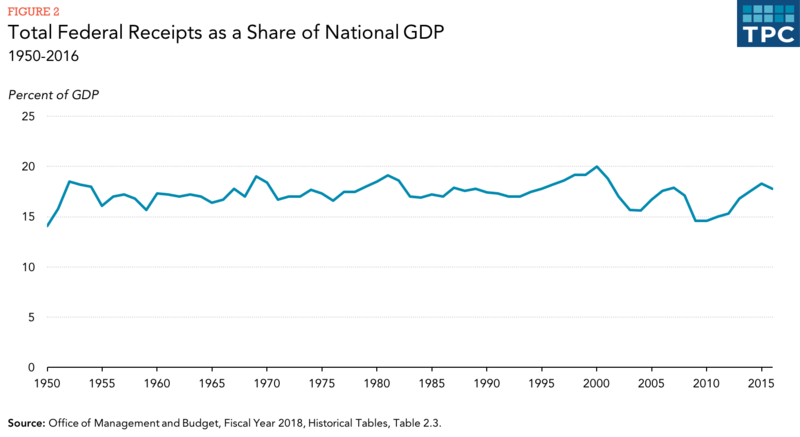 Revenue from the tax has fallen from an average of 3.7 percent of GDP in the late 1960s to an average of just 1.5 percent of GDP over the past five years. Taxes on purchases of a mélange of goods and services, including gasoline, cigarettes, alcoholic beverages, and airline travel, generated 2.9 percent of federal revenue in 2016. But these taxes, too, are on the wane: excise tax revenues have fallen steadily from an average of 1.7 percent of GDP in the late 1960s to an average of 0.5 percent over 2012–16. The federal government also collects revenue from estate and gift taxes, customs duties, earnings from the Federal Reserve System, and various fees and charges. Total, these sources generated 6.5 percent of federal revenue in FY 2015. They have averaged between 0.6 and 1.1 percent of GDP since 1965. In recent years, the figure has been on the high end of that range because of unusually high profits of the Federal Reserve Board related to its efforts to stimulate the economy since 2008. 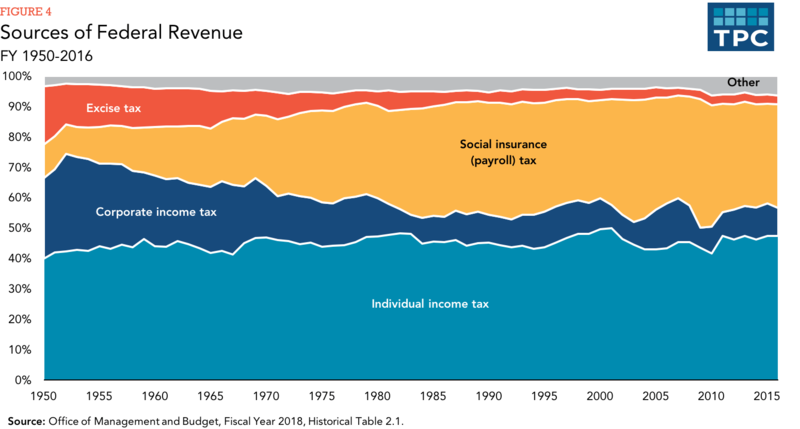 The individual income tax has provided nearly half of total federal revenue since 1950, while other revenue sources have waxed and waned. Excise taxes brought in 19.0 per-cent of total revenue in 1950, but only about 3.0 percent in recent years. The share of revenue coming from the corporate income tax dropped from about a third of the to-tal in the early 1950s to just over a tenth in 2016. In contrast, payroll taxes provided a third of revenue in 2016, more than three times the share in the early 1950s. All years in entry are fiscal years. Joint Committee on Taxation. 2014. Overview of the Federal Tax System as in Effect for 2014. JCX-25-14. Washington, DC: Joint Committee on Taxation. Q. How does the federal government spend its money? A. In fiscal year (FY) 2014, about 60 percent of federal spending paid for programs not subject to regular budget review, while just over a third covered discretionary programs for which Congress must regularly appropriate funds. Less than a tenth went for interest on government debt (figure 1). new entitlements, including Medicare and Medicaid (both of which started in 1965), the earned income tax credit (1975), and the child tax credit (1997). In addition, rapid growth of both the elderly and disabled populations has contributed to increased Social Security and Medicare spending. Nearly 60 percent of mandatory spending in 2015 was for Social Security and other income support programs (figure 3). Most of the remainder paid for the two major government health programs, Medicare and Medicaid. 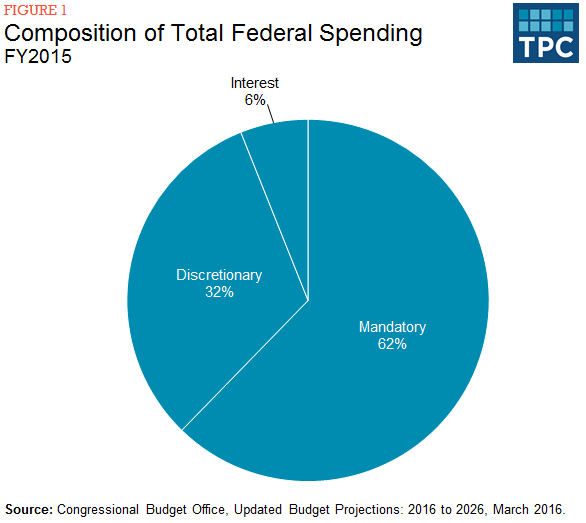 Discretionary spending covers programs that require appropriations by Congress. 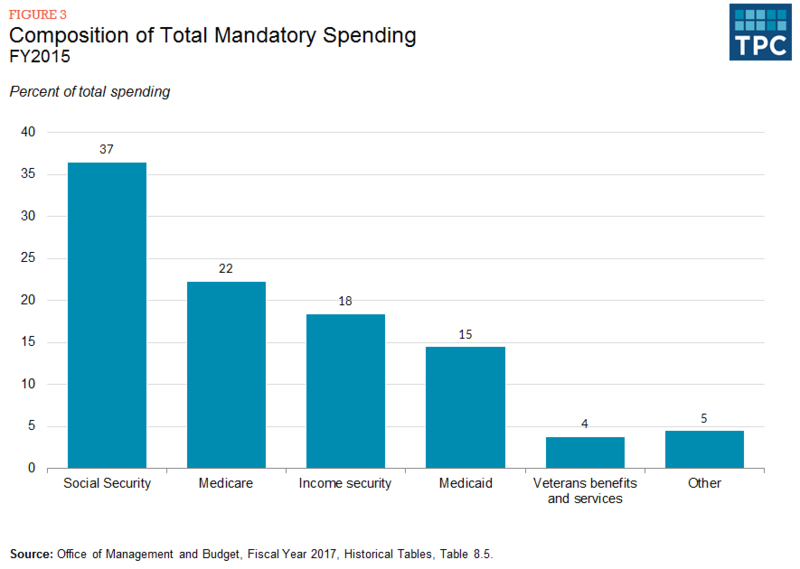 Unlike mandatory spending, both the programs and the authorized levels of spending require regular renewal by Congress. 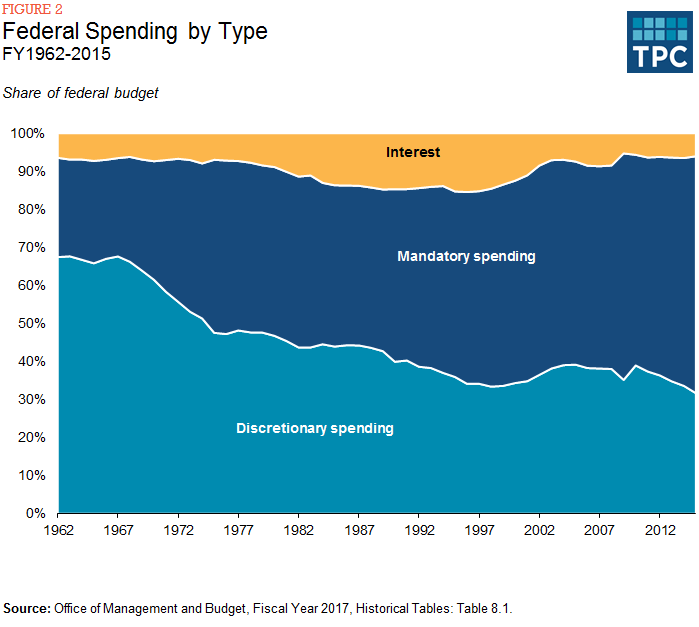 The share of the budget going for discretionary spending has fallen from two-thirds in 1962 to about one-third now. including agricultural subsidies, highway construction, and the federal courts (figure 4). Only 4 percent of discretionary spending funded international activities, such as foreign aid. Interest on the national debt has fluctuated over the past half century along with the size of the debt and interest rates. It climbed from 6 percent of gross domestic product (GDP) in 1962 to more than 15 percent in the mid-1990s, fell to about 7 percent in the early 2000s, and has fallen even more recently, as interest rates have tumbled to historically low levels. While the national debt reached a peacetime high of 74 percent of GDP in 2014 and dipped just under that level in 2015, debt service accounted for just 6 percent of federal spending in 2015. Congressional Budget Office. Budget and Economic Outlook: Fiscal Years 2016 to 2026, Historical Budget Data.